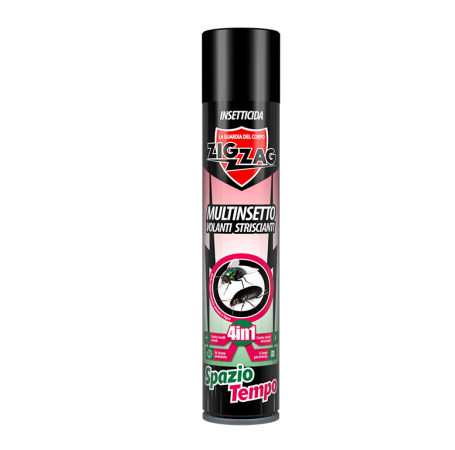 Zig Zag Spazio Tempo for rapid action in Space and long-lasting persistence in Time is effective against Flies, Mosquitoes, Moths, Dappers and other flying insects and against Cockroaches, Ants, Scorpions, Millipedes, Spiders and other crawling insects. One product to solve all the problems of annoying insects. This product is also available in d 65. Spray the products into the room to treat for a few seconds (4/6) as high as possible and with a circular movement. It can be used for solving an already existing problem and for preventing infestations by flying and crawling insects. In the latter case, treat the surfaces or objects (shutters, mosquito nets, etc.) that you want to render repellent to insects. Ventilate the room before using it again. In the air of the environment to treat, on all surfaces in the home, loggias, verandas, terraces and exteriors in general, on door and window jambs, on gratings, mosquito nets and gazebos, on curtains, on walls and floors.